For spectators and fans, the 118th Boston Marathon ended yesterday; but for many runners, the 26.2 mile run-of-a-lifetime will stay with them for weeks - even months- through the pain of injury. In fact, incidence rates for injuries reported for athletes training for marathons can be as high as 90%! Of those,about 15% of all running injuries strike the foot. This is not too surprising since each step, our feet absorb several times our body weight. One common runner’s injury is Plantar Fasciitis. What is Plantar Fasciitis? Plantar Fasciitis is small tears or inflammation of the plantar fascia, a thick band of connective tissue on the bottom of the foot that supports the arch. The plantar fascia extends from calcaneus to the metatarsal bones like a cable connecting the front and back portions of the foot. A tear or inflammation of the plantar fascia can be due to direct trauma, such a blow or jumping or as noted, long distance running. Symptoms include localized heel pain, swelling, bruising, limping, and a sensation of the arch falling. Some patients even hear a pop when they tear the plantar fascia. The pain experienced is typically the worst in the morning. Can MRI diagnose Plantar Fasciitis? MRI scanning is particularly useful in diagnosing tears of the plantar fascia and differentiating them from plantar fasciitis or a fibroma. Sometimes a tendon injury or stress fracture can mimic a tear of the plantar fascia. 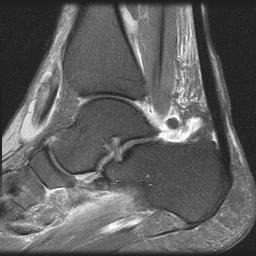 MRI can easily distinguish these entities from a plantar fascia tear. 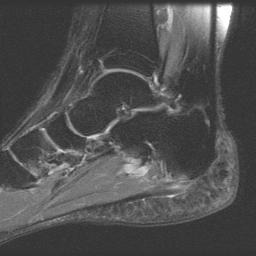 The MRI images shared below show a normal plantar fascia and one with a tear. The tear is clearly shown through the use of an MRI; the patient’s doctor is now able to diagnose him and develop a treatment plan for healing. Am I at risk? Plantar fasciitis is a top foot complaint among long-distance runners who place a lot of stress on their heel and particularly in those with very high or very low arches. In addition, people who are overweight (excess pounds put extra stress on your plantar fascia) and those who wear shoes with inadequate support are at risk of plantar fasciitis. Plantar fasciitis is most common between the ages of 40 & 60. What does recovery look like? Recovery time can range from three months to a year, but the average is six months. It is a ‘nagging’ injury and while you can continue to run, it will likely delay healing and a break from running may be best. Rehab may also be recommended by your doctor. What will an MRI cost for Planta Fasciitis? MRI costs can vary depending on the type of scan and the facility where you receive your care. Shields MRI has more than 25 facilities in Massachusetts and one in Portsmouth, N.H. – all of them offer the gold standard in MRI technology and the very best value. In fact, most Shields MRI centers can save you up to 60% or more when compared to higher-priced hospitals. So you can get the same MRI experience as New England pros on the Patriots, Celtics, Revolution and Bruins – at a big savings. Dr. Steve Sweriduk, Medical Director, Shields MRI.